All Demos Sloped Railing Designr is a lisp routine that draws any size Flat/Slope/Stair Railing using the Sloped Designs you pick inside the Sloped Railing Designr dialog. Also "end-return rails" for landings on stairs! Railing designs doesn't get any faster than this!!! As you change the configuration of the railing, you can "see" the changes "on-the-fly" as they happen, right inside the main dialog! (Fully dimensioned elevation-view and section-view. Quick & Easy!). Sloped-Railing-Designer.lsp is released as an add-on option to Custom-Railing-Designr! Sloped-Railing-Designer.lsp Video showing all the available Options. Add your own title-block to the programming data! Model-Space or Paper-Space tabs, it's up to you! When you add your title-block to the data it becomes the default title-block! How to add your own Title-Block to the program! Using Title-Blocks with the program! Now users can Calculate the Rise & Run from the Degree and Slope-Length you measure in the field! Now you can Calculate the Rise & Run! Adjustment of Base-Plates to the post! Adjust the X-Y offsets of the Base-Plates to the post! This also allows the user to pick the Base mounting option too! (Top or Front). The Section-View auto-adjusts for CoreDrill, Top/Flat or Front/Side mounted Base-Plates! Now users can quickly use Side-Mounted Base-Plates! Adjusting the depth of the Base-Plates to the mounted surface allows even greater design control! Now you can use Side-Mounted Base-Plates! Pick a Title-Block to change Scale-Factors to the current drawing! Now users can quickly change Scale-Factors to the current drawing at the click of a button! User control Dimscale/Text-Size/LT-Scale factors with the DMSS_titleblock program! AND the DMSS_titleblock program can be used "as a stand-alone" on all your everyday drawings too! Quickly change Scale-Factors to the current drawing! 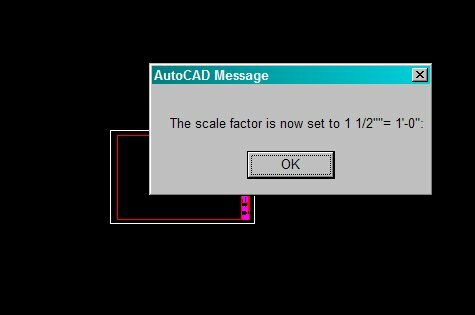 Scale-Factors are automatically adjusted to the current Railing-Length! (the longer the railing, the larger the Scale-Factors are). Also changes the current Title-Block to the proper size! 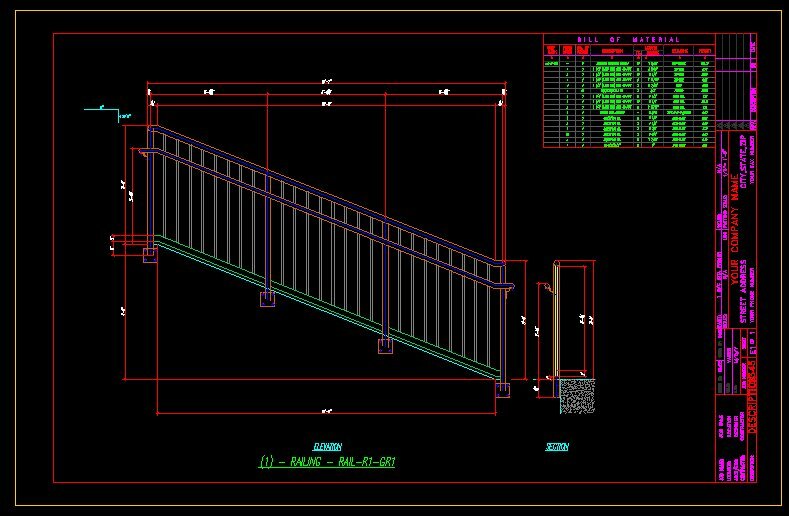 Quickly add Railings to an elevation of a stair by picking points for run/rise & post-centers! Quickly add railings to stairs! Place the posts where you want them! Now users can pick points for run/rise on an elevation of a stair, and mover the CENTER POSTS to rest on the center of treads! User don't have to worry about re-drawing the Pickets when moving the posts around, just use the NEW Picket-Calculator to add pickets back to the bays! Quickly add pickets to different bays sizes! Quickly add the complete "Submittal Package" with the new railing designs! Quickly add the complete Submittal Package! This is the 1st in the NEW series of "the Railing-Design Tool-Box"! Quickly add the complete Top-Mounted Erection Drawing Plan! Quickly add the complete Face-Mounted Erection Drawing Plan! This is a powerful Steel-Font Converter that changes any Architectural text into steel stacked text instantly. Completely customizable, add your own stacked fonts to the program! This powerful Arc'd railing program draws the plan-view layout! It also has an option to either "Pick or Draw" an Arc! This program was designed to help users layout Pickets in everyday drawing duties! Takes care all the calculations and offsets for you. This program was designed save (in a file of your choice) the e-data of objects that the user selects! Still in developmental stages, this program will be like a block that thinks! 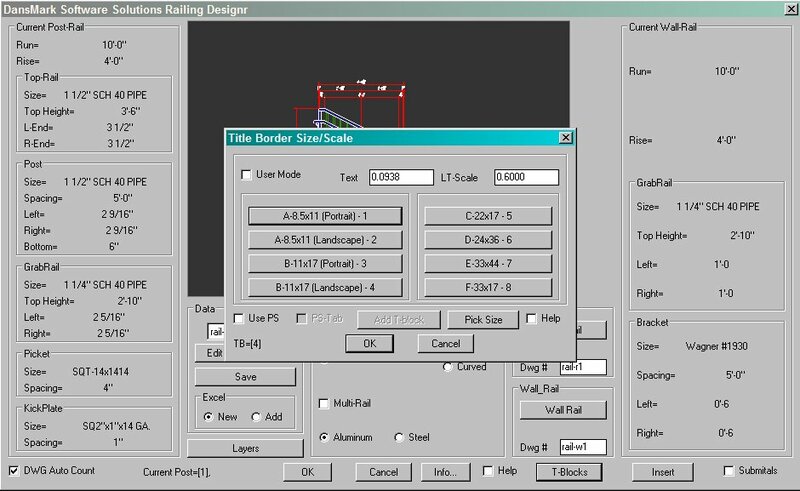 The user selects drawing objects for the start of a hand-rail (that isn't already in the railing programs), then the user can save them to an e-data set that can loaded (like a program) and will adapt to the current variables of the railing programs! The user will define the variables for all the entities (it will even have a listing of all the railing component variables to pick from), or enter "user" variables for the components! 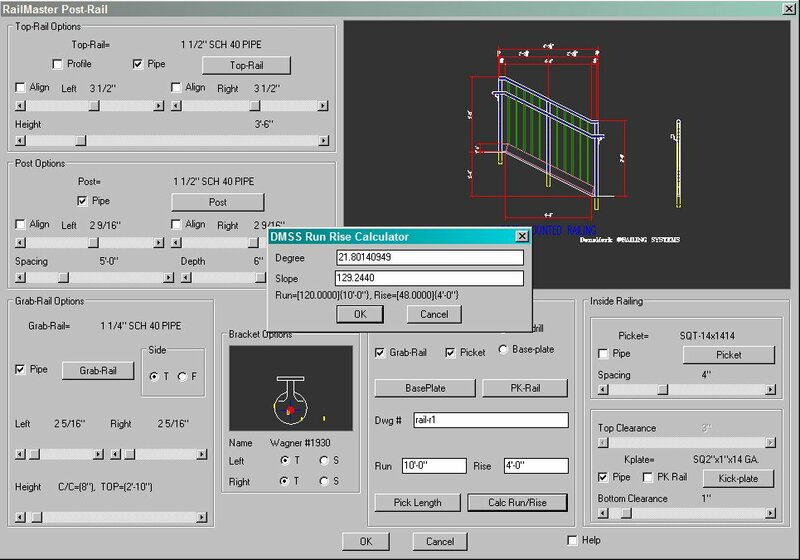 You have so many options with all the different "Designr" programs (Updated to 3 included with this version), it is literally possible to design hundreds of thousands of Sloped Railing configurations with this program! This is a sample of the Sloped Railing Designr Program. Base-plates can be fastened 2 ways, either to the "top" or "face" of the stringer/structure! AND adjust the "face-mounted" vertical offset from the nosing-line to the center of the base-plate! 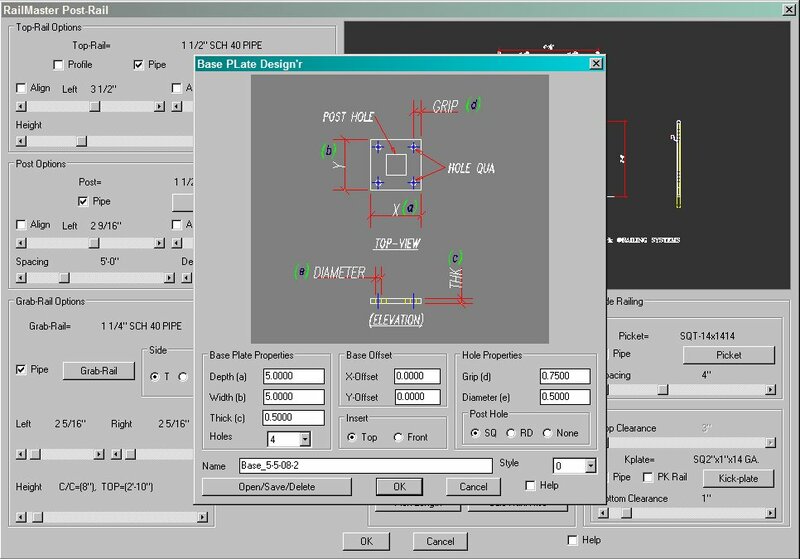 The saved configurations include "all" current variables assigned in the dialog, including everything in all the current "Designr" programs! 1) Main Program and Dialog. This is where everything is configured and accessed from. This is where you select the Top-Rail "Profile" to use in the current design. Also this is where you add your own Profiles to the program (make sure to watch the video on how this process is done!). This is were you configure you Base-Plate designs. Also users can adjust the Base-plates in the "X-Y" coordinates for different mounting options! 5) Picket-Railing Designr (picket channel). This is were you configure you Picket-Railing/Channel designs. Adjust the Picket-railing dialog variables to your channel-shape, then save them for future use! 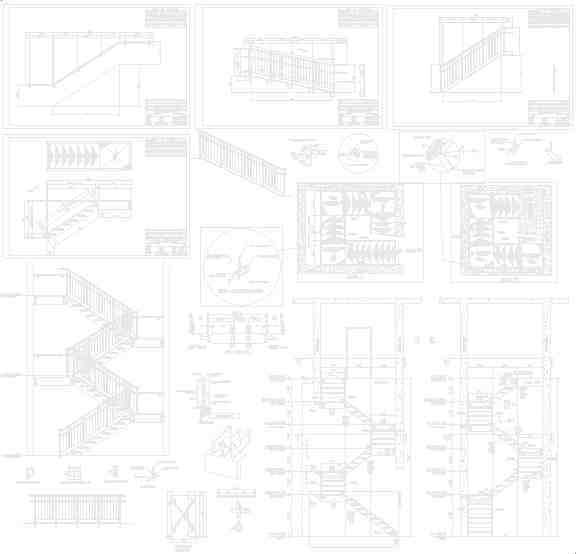 Draws Railings in elevation, section and shop drawings.